Last week, I was at the courthouse and bumped into my realtor and friend, Susan. I was rushing out, and she stood behind closing doors on an elevator, so we waved at one another. An hour or so later, she called me, and we caught up. Susan and I met through church about six or seven years ago, I think. When I decided to sell my home and move out into the country, I asked her to list it for me, and she did. More than that, she held my hand and recognized me for what I was – “an emotional seller.” She patiently guided me through the process and helped me sell my beloved home. I appreciated then what she did for me as my realtor. Today, I appreciate Susan as my friend. When we caught up last week, I talked to her a little about life and ruts and uncertainty and needing a sign from the heavens. I recall telling her that I need my sign to be in writing just to make sure I don’t miss it. I believe in the human spirit to prevail. 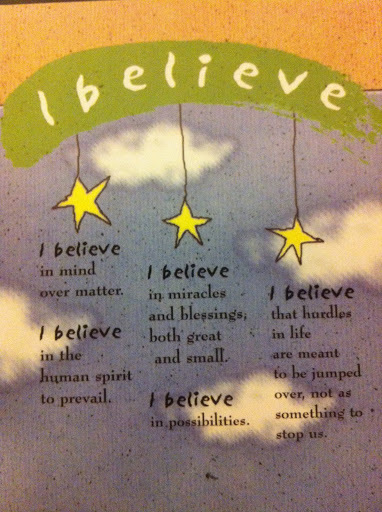 I believe in miracles and blessings, both great and small. I believe that hurdles in life are meant to be jumped over, not as something to stop us. Thank you, Susan. Thank you. Any idea where to get this card? Is there a company or website listed on back? Thank you!